The younger cast, they just don’t have the presence to match Will Smith’s hotshot pilot from the earlier film. We also don’t get one clear hero to root for. Apart from a few impressive bits of sheer CGI spectacle, the film is sorely lacking in memorable moments and ends up feeling like a slog. I’m going with one-and-a-half out of five for Independence Day: Resurgence. It doesn’t even deliver on the promise of dumb fun. For that, it needed to be a little less dumb and a lot more fun. The special effects used for destruction scenes are spectacular and enhance the visual experience. 3D viewing is avoidable as the perpetual dark hues on screen strain the eyes. The film also drags towards the end. Nonetheless, if you enjoy formulaic chaos and are fine with cliched celebration of human resilience, this one’s quite engaging. We wish there was at least one iconic scene though. The stuff that Marvel offers you in abundance. This is the kind of film everyone watches, which should ideally be an indication for them to try harder. These films are guilty pleasures and cheat days after you’ve seen all your Revenants and Fellinis. But like that pizza you devour after displaying months of agonising restraint, it’s going to make you really, really sick. You don’t expect anything but superficial entertainment in this bang-for-buck movie, and this sequel doesn’t even deliver on that. It wouldn’t hurt to start with an interesting story, and not cash in on the sequel bandwagon of a successful film. It’s sad to see a man like Roland Emmerich struggle to make a decently entertaining film, right up his alley. Maybe he is not as good as he used to be. Or maybe the standard of a spectacle has shot way up in the past decade. Time to smell the coffee, Mr Emmerich? Some of the fights are impressive, most of the destruction routine (“The aliens are going for the landmarks,” comments Levinson at one point as the Tower Bridge of London collapses), and a large part of the dialogue perfunctory. And yes, there is the speech by the US President which “the world is listening to on short-wave radio”, about how, “irrespective of colour and creed”, everyone should pray for the soldiers going in for this inter-galactic war. Overall, INDEPENDENCE DAY: RESURGENCE that can be said to be a good successor to the original comes across as a visual treat that could have been much better had the film not been rushed. In fact, while the first half of the film plays out well, establishing each new character and recapping what happened in the previous film, the second half comes across as being highly rushed, seeming as though the director Roland Emmerich was hard pressed to wrap the film within the two hour time frame. 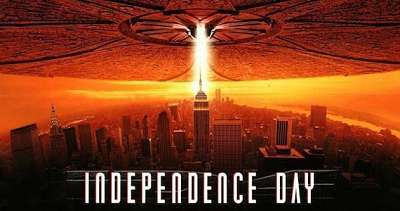 On the whole, INDEPENDENCE DAY: RESURGENCE is a visual spectacle and is a must watch on the big screen. .
Twenty years after the events of the first film, the international community recovers and the United Nations creates the Earth Space Defense (ESD), a united global defense program that serves as Earth’s early warning system. The main defense force uses technology salvaged from the remains of the alien forces, with military forces assembled on the Moon, Mars and Rhea, and the Area 51 base has become the Space Defense Headquarters. However, the aliens were able to send a distress signal to their other battalions before their final defeat while others went into hiding elsewhere around the world headed by their queen. Upon receiving the signal, the aliens in deep space send a larger and more powerful battle fleet, thus threatening the human race once more.